Joyce Glasser reviews The Disaster Artist (December 1, 2017) Cert 15, 103 min. 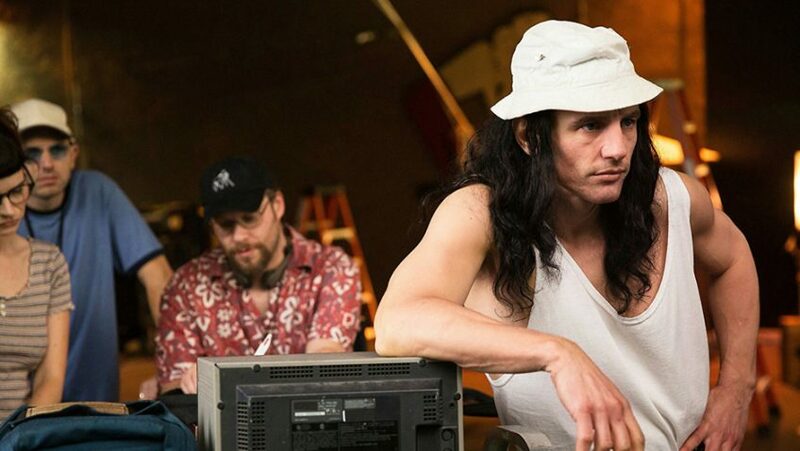 It will take most of the space of any review to explain what you will be watching if you go to see The Disaster Artist, James Franco’s erratically hilarious movie about the making of a movie – that actually exists. And while no masterpiece, if you factor in the novelty, fun and terrific true story factors, it’s definitely worth seeing. The Disaster Artist might just well be James Franco’s best film as director, and one of his best as an actor. Though written by Scott Neustadter and Michael H Weber, who are best known for their serious films about young people such as romcom weepie, The Fault in Our Stars) and coming-of-age story, Paper Towns), it is adapted from actor Greg Sestero’s ghost written book The Disaster Artist: My Life Inside The Room, the Greatest Bad Movie Ever Made . The movie in question, The Room, was risible flop in 2003 which has since broken even thanks to a ‘Rocky Horror Picture Show’ cult revival. The book was written after everyone learned to look back and laugh at the film that was so bad it was good. Franco’s The Disaster Artist , is then, (are you ready? ): a film-with-in a film; an origins movie; a remake of ‘the making of The Room’ and a remake of many scenes in the original 84 minute film The Room (at the end, stills from the original are shown next to this film’s versions). If you are still confused, midnight screenings of the original 2003 film pop up around the country, most notably at the Prince Charles Theatre, Leicester Square, or, you can apparently catch it on line. 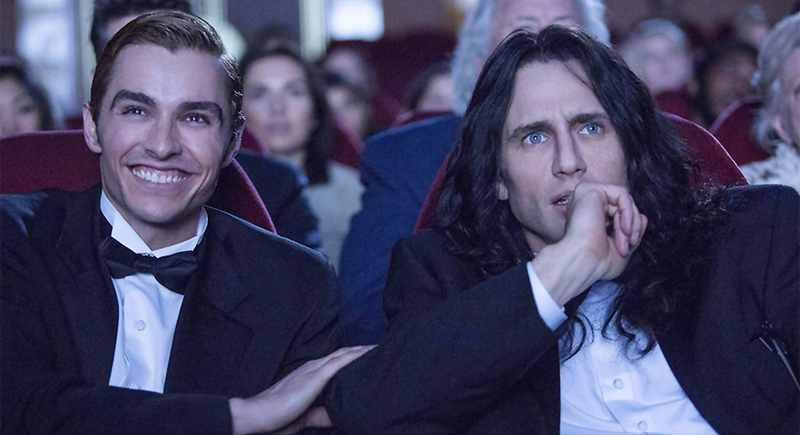 The Disaster Artist is also a buddy movie with the two friends who share this truth-is-stranger-than-fiction journey being played by brothers James (This is the End, 127 Hours, Pineapple Express) and Dave (Bad Neighbours, 21 Jump Street, Now You See Me) Franco. James plays acting student turned producer/writer/director/star Tommy Wiseau as well as his character Johnny. Dave Franco plays the line-producer, actor Greg Sestero and his character, Mark). The two main characters meet in a San Francisco acting class (their teacher is played by Melanie Griffith) where Tommy is already trying out a melodramatic scene that ends up in The Room. Tommy’s performance might be a bad imitation of Marlon Brando’s Stanley Kowalski in A Streetcar Named Desire if Tommy had ever seen the film. Tommy is not only the oldest actor in the class; he has the longest and wildest hair and the weirdest accent (it doesn’t help that he mumbles). He is also the most ignorant when it comes to cultural references, be they theatre or film. Bright eyed Greg, a shy 19-year-old with good diction, movie star good looks and no discernable acting talent, is intrigued by this confident man-of-the-world, who, to Greg’s surprise, is happy to befriend him and encourage him. Greg, who still lives with his parents, is also fascinated by Tommy’s expensive car, his apartment in San Francisco and by news that Tommy owns a pied-à-terre in Hollywood. Egged on by Tommy’s ambitions, there is nothing to stop the two aspiring stars from following their dreams. Greg’s mother (Megan Mullally, in a great cameo) tries in vain to stop her son going off to Los Angeles with this weird older man who is a complete stranger. While Greg finds an agent (Sharon Stone) and soon falls into the social circuit of a group of jobbing actors, Tommy’s clumsy and presumptuous manner is a big turn off, and he is soon depressed. Greg is accepted, but he is not doing much better with landing actual roles. One afternoon as Greg tries providing moral support, Tommy, the idea of making their own film emerges. The major stumbling block for most first time filmmakers is financing, but here it is only talent. Most writer/actors who want to make a film would bring an experienced producer on board, but such a figure is incompatible with Tommy’s ego and insecurity. While the patrons of a sound studio with in-house equipment rental try to advise Tommy to rent the gear by the week, which is standard, Tommy insists on buying it outright. If the casting process is entirely random so is the hiring of the production team. Fortunately, Tommy ends up with a responsible and professional production team, including script supervisor Sandy (Seth Rogen). Rogen has many of the film’s funniest lines, and they are not wasted. In one scene Sandy goes into the bank to cash his first pay cheque convinced that Tommy is a fake and there will be no funds (he’s been there before). To his surprise, not only are there funds, but the bank clerk suggests there is plenty more. He might have found a good production team, but listening to them is another story. As the budget overruns and the cast and crew lose morale, so the production drives a wedge through the two friends’ relationship. Tommy becomes jealous of Greg’s new girlfriend, Amber (Alison Brie). While the possibility that Tommy is gay lingers over Tommy’s violent reaction to Greg’s announcement that he is moving in with Amber, it is never made explicit in the film. Tommy’s reaction could just as well be separation anxiety stemming from childhood. If Tommy remains a mystery to the audience, Greg is never able to figure out Tommy’s real age, where he comes from (he claims he’s from New Orleans) or how he made his millions. To this day no one can answer these questions definitively. James Franco has turned The Disaster Artist into a celebration of Hollywood, and has peppered the film with Hollywood royalty. Apart from Franco’s friend Seth Regan any cameos from Bryan Cranston, Sharon Stone and Melanie Griffith, known actors including Jacki Weaver (playing Claudette in the Room), Franco’s friend Zac Efron (as Chris-R in the Room) and lesser known actors – representing the majority – have roles in the film. One of the best in-jokes is an excruciatingly embarrassing scene in which Tommy approaches an irate producer in a trendy Los Angeles restaurant. The famous producer is played by real life writer/director and producer extraordinaire Judd Apatow who discovered James Franco and has produced several films in which Franco stars.